﻿With modern building regulations calling for higher and higher standards of construction, one of the requirements coming more and more to the fore is the whole subject of random or uncontrolled warm air leakage or put another way, cold air leaking into a construction. To put it simply if your building is leaking warm air due to a lack of air tightness then you will decimate the actual "U" value you think you have. We're not in the business of negative marketing here at Fusion, but equally it should be known that the quoted thermal values of any insulation, otherwise known as U values is a measure of the rate of heat transfer only. The smaller the U value the better while the larger the figure the worse. But it's more complicated than that simple figure as there are other factors at play that determine your home or building's ability to resist heat loss (or heat gain as the case may be, depending on the season) . U values are arrived at using a laboratory test and these standards tests do not take account of air leakage or drafts. So the U value figure while useful is only part of the story.The other main factor is air leakage or air tightness of a structure. Put simply you can have a fantastic U value rating but a still have a cold draughty building. Why? Because if your building has uncontrolled air leakage or high air changes per hour, then heating your building will be the metaphorical equivalent of 'shoveling light into a dark hole'. Air pressure testing is a defined process whereby a trained professional attends at your building complete with calibrated test equipment. The test equipment usually involves the use of what's known as a blower door. This door frame mounted fan is computer controlled and it uses typically negative pressure (sucking the air' out of your building so as to induce air leaks from elsewhere in the structure). Standard opening such as windows , sewerage pipes etc are blocked off and what's being tested for is air leaks in the fabric of your external structure. The blower door fan and the attached computer, after running a series air pressure test (measured in Pascals /Pa) delivers a result. These results are translated into air leakage results for each m2 of external surface area of your building and also related to the volume of your building . The current standard for air pressure testing in Irish dwellings under Part L TGD is a performance level of 7 m3/(h.m2) .Translated that means that each hour your building must not leak 7000 lits of air per m2 of external surface area of your building. What's not mentioned here is that your building is pressure tested at an average negative pressure of 50 Pascals. That's meant to simulate roughly equivalent to a 25-30 MPH wind-speed across your building. 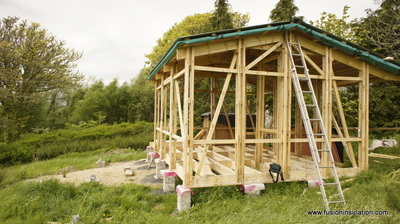 So, 7 cubic meters per m2 per hour is the threshold . Lower than that is better. Greater than that value means your home will be harder to heat and it will be more difficult to created a stable thermal environment and this is irrespective of the depth of insulation you have. Air Changes Per Hour (ACH) ; This is another figure used to gauge the performance of a building in terms of uncontrolled air leakage. Air changes per hour is based on the volume of air leaving the building in relation to it's overall internal volume. This figure is used for example in Passiv Haus testing where the ACH standard is .6 air-changes per hour, a very high standard indeed and not currently required for mainstream dwellings in Ireland, not that the Passiv standard isn't a bad thing to be aiming for i.e. the lower the number of uncontrolled air changes per hour , the more stable the environment will be in your home, all other factors being respected. Here at Fusion we tend to go easy on hyperbole and heavy on facts so just for you, our customers and potential customers, we commissioned a case study to independently verify some of what we've been saying for a long time. What we've always maintained is that Fusion Spray Foam when used in a building is two systems in one, for the price of one. That is, thermal insulation with leading U values and an air-tightness system combined, all in one. 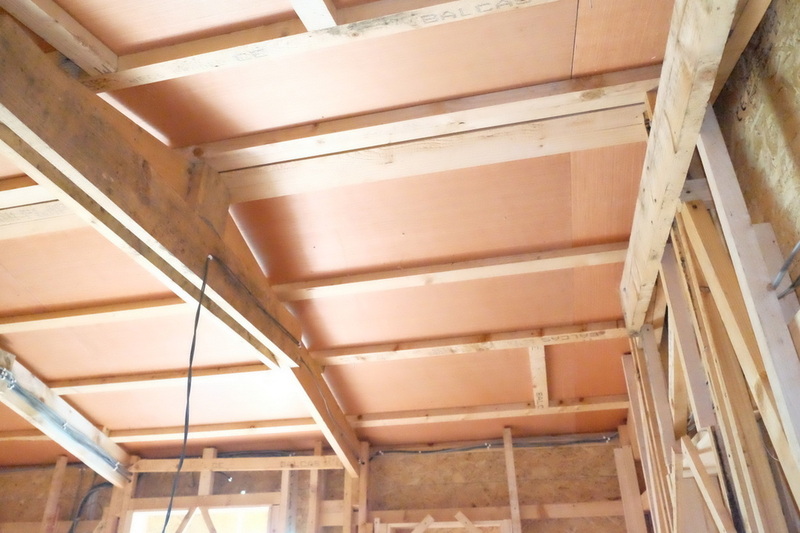 Typically what happens, is a building owner will specify a roll or sheet insulation for thermal insulation and then specify an air tightness membrane and air seal tape system to achieve a high level of air-tightness. This is a reasonable approach but it's expensive if you add the cost of the two together and involves two separate systems with competing requirements on site and two separate trades to manage as well . What if there was system that achieved both outcomes in one system, during the same installation? 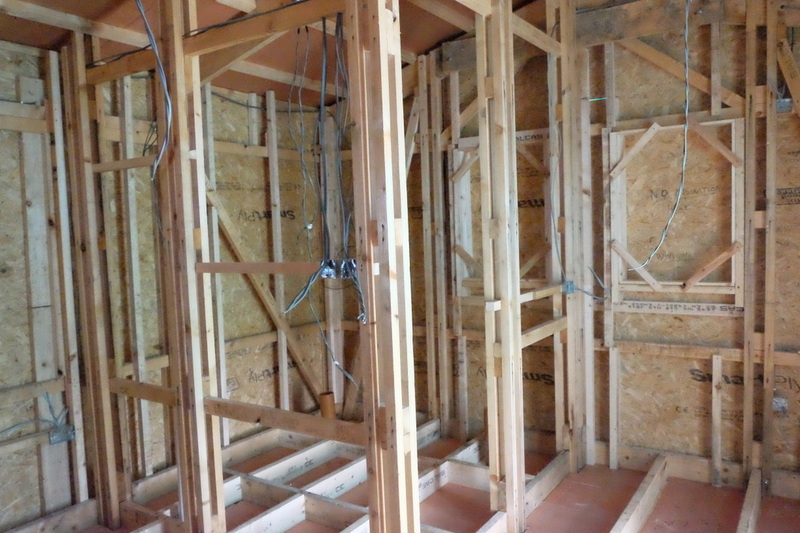 The following case study, carried out on a new build timber frame construction was commissioned to test if that claim holds any air (pardon the pun) . The building in question was a chalet being built using a post and beam type construction and was selected because the owner wanted spray-foam used in the floor , walls and roof cavities. 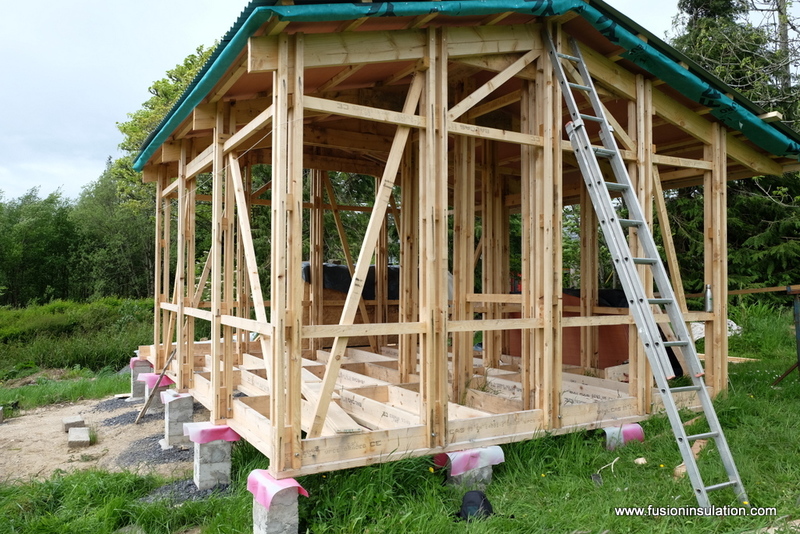 This chalet itself was clad in simple plywood sarking and a wall and roof building felt was used to protect the plywood sheathing from rain . The weatherproof membrane was not airtight and was not taped in any way simply being fixed onto the structure using staples and batons . we (Fusion) must never have worked with that individual before or had any prior relationship, so as to ensure the integrity of the results i.e. a completely independent test. Thus we selected Mr. Christ Spoorenberg from www.ecoscan.ie to conduct the tests according to EN13829 testing norms. We approached this project with air pressure testing in mind i.e. we were careful in placing the foam in any void that could leak and these works takes longer than a normal non testing situation. Some will say that "these results are not representative" of a typical Irish home? In response we would add that this type of construction would have required a separate air membrane system installed had it not been for foam such was the complexity of its construction detail and would have leaked air massively had traditional roll and sheet insulation been used exclusively. 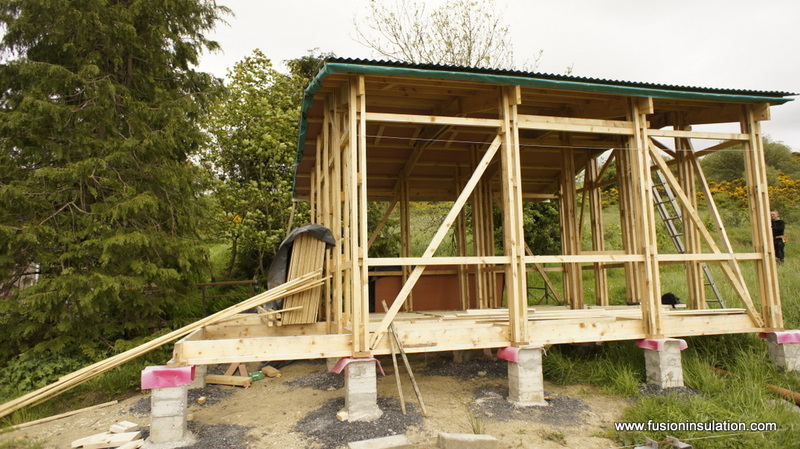 In a traditional Irish home using concrete floors and internally rendered block construction these surfaces are already airtight. The weak link in most homes is the roof construction. 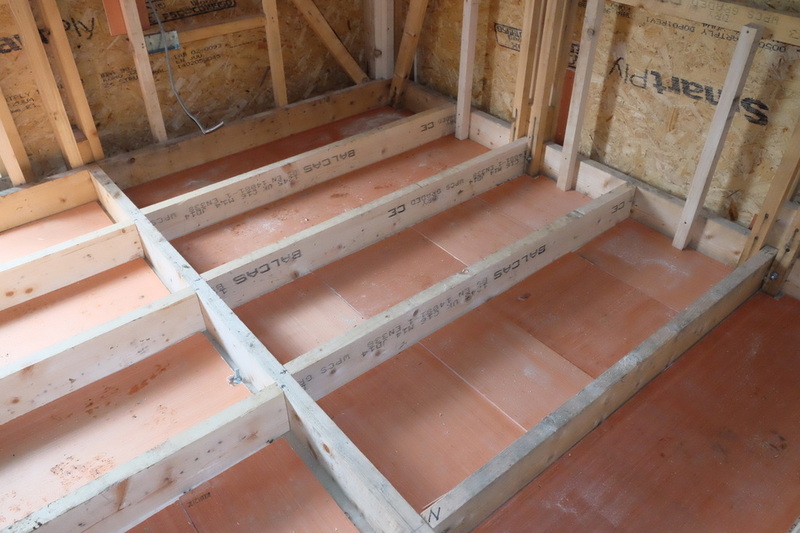 Fusion Foam is particularly good in roof details which are notoriously difficult to seal even using air membrane systems and air tightness tapes. Mr. Spoorenberg from Ecoscan speculated while on site, that had his tests been carried out on the roof section only, he envisaged a result of less than 1 ACH per hour on the roof . 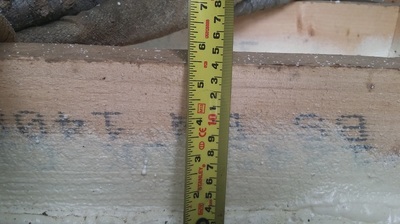 This speculation, in our opinion related to the fact that in this situation the roof in the chalet did not have its surface foam cut flush . Is Foam a magic bullet that can cure all leak test failing constructions? Not really. 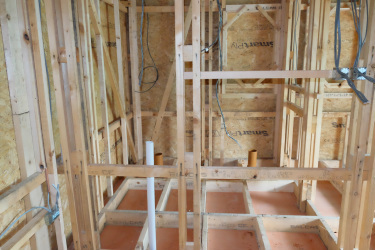 For foam to work well in an air sealing application it has to specified at the start with thermal insulation and air tightness specified from the beginning. Fusion Foam is not meant to be a 'fire brigade' solution, where we are called in to fix a problem, and to metaphorically bolt the stable door after the horse has bolted. If your building is nearly complete then often it's too late to fix a air leakage problem. Always bring in an air pressure testing expert early on in a project. They are the people best positioned to give you good advice. 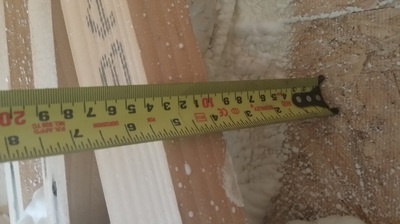 Can any Spray Foam achieve these results? To achieve high air pressure testing results requires good materials and an excellent quality of installation. Here at Fusion Foam we have carried out many air pressure sealing projects and not every foam company has this level of expertise. Is Fusion Foam approved by Passiv Haus? 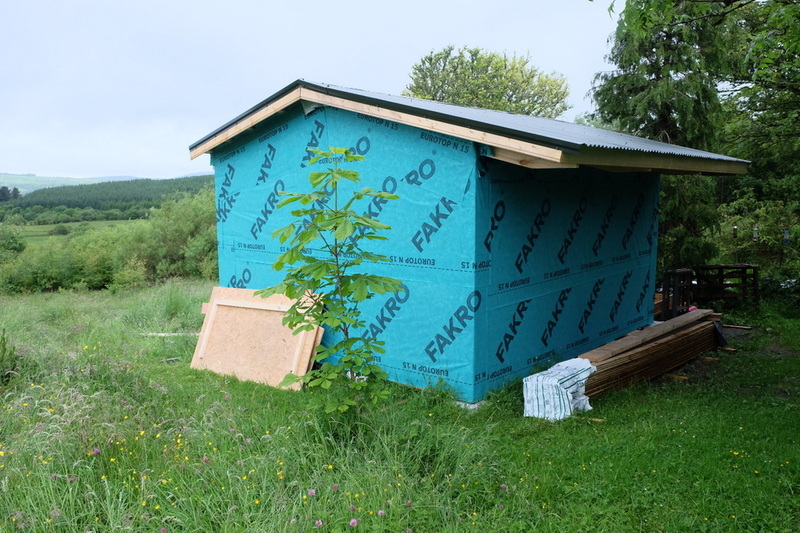 For reasons currently unknown the Passiv Haus people in Ireland don't recommend Fusion Foam for air sealing, recommending air barrier membranes and air sealing tapes instead. 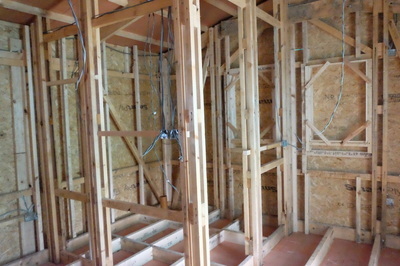 If air barrier membranes and air sealing tapes are installed by professionals and then installed correctly, they work very well. We have no grievance with these systems other than the cost imposition of such a recommendation often ranging from €20/m2 to €40/m2 of surface envelope depending on the project. The average house owner cant afford or economically justify that extra cost and to be fair most people don't want or need .6 ACH and are happy with somewhat less. Could Fusion Foam get to .6 ACH ? Yes we believe it could .................. and sometime soon we're hoping to bring you a case study to prove it.